Comments Komentari isključeni za The threat of another genocide in Bosnia is real. Who will act to stop it? 25 Jula 2018, Comments Komentari isključeni za The threat of another genocide in Bosnia is real. Who will act to stop it? As the international community looks on, the president of the Republika Srpska is travelling along a darkly familiar path. Milorad Dodik, president of Bosnia and Herzegovina’s Serb-majority Republika Srpska, is not a fan of the Muslim call to prayer. “Imams in Bosnia who call the adhan are howling,” he said recently on a popular Serbian TV show. Dodik has been spewing out hate speech aimed at Bosniaks – Bosnian Muslims – for years now. His pronouncements on the dissolution of Bosnia, glorification of war criminals, genocide denial, and references to “too many mosques” have become a regular feature of political life in the Balkans. In 2017, he even accused Bosniaks, who were forced to move from their homes of origin during the war, of “occupying the valley of the Drina River again”. Bosniaks have lived in the area for centuries and are returning after genocidal expulsion to a region that was the site of a number of war crimes committed by Serb forces during the Balkans war, most particularly the Srebrenica massacre. So far, Bosniak politicians and the international community have failed to respond properly to Dodik’s fascistic statements. Harun Karcic, of Al Jazeera’s Balkans channel, believes the statements are blatantly Islamophobic. Even more dangerous is the fact that Dodik’s statements and actions seem to be supported by a significant majority of Serbs in Bosnia and Herzegovina, indicating that the process of reconciliation has not begun. Only a decade ago, Dodik was viewed as a moderate politician by the international community. Yet, there is no difference between what he says now and what convicted war criminals Radovan Karadzic, Ratko Mladic or Biljana Plavsic used to say before and during the war. Dodik’s statements violate the Dayton Agreement that ended the Bosnian war. Annex 7 specifically says that “all refugees and displaced persons have the right freely to return to their homes of origin”, and that political authorities have an obligation to secure a safe return “without risk of harassment, intimidation, persecution or discrimination”. Not only did Serb authorities fail to provide the conditions for their safe return, but they are a constant threat to the Bosniaks who did return. Emir Suljagic, who wrote Postcards from the Grave, a first-hand account of the Srebrenica massacre, says there is no difference between the current official Serb rhetoric and the rhetoric responsible for the genocide. For years, Dodik has been repeating that the Republika Srpska will secede from Bosnia and possibly join Serbia. But even he knows that his regime will not be able to secede without a new conflict. The Bosnian Serb police have purchased thousands of guns this year and have established strong relations with Russian President Vladimir Putin, resulting in Russian military training for Dodik’s police and paramilitary forces. “Dodik’s type of rhetoric is the one that precedes physical violence, and considering the potential for violence, including thousands of arms and apparently anti-aircraft missiles that his regime has recently purchased, I am sure that this is an announcement of the new violence aimed primarily at the Muslim majority in Bosnia and Herzegovina,” Suljagic said. Meanwhile, the international community and the EU have left Bosnia and Herzegovina on its own. 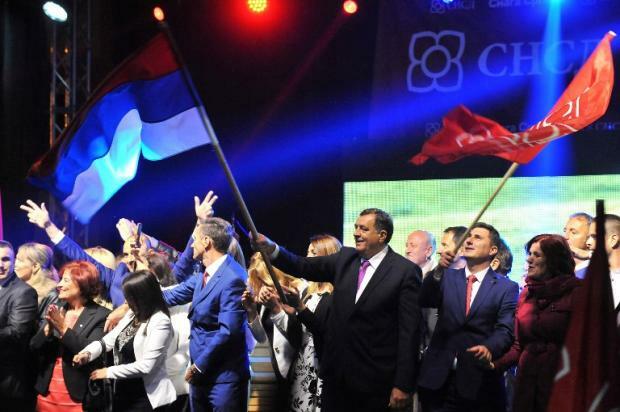 Despite the obvious separatist moves, dangerous rhetoric, discrimination and stigmatisation of Dodik’s regime, it has been given ample time and space – along with its Russian allies – to prepare for its ultimate goal. Even more dangerous is the fact that Dodik’s statements and actions seem to be supported by a significant majority of Serbs in Bosnia and Herzegovina, indicating that the process of reconciliation has not begun. According to an Al Jazeera study published this month, only a small number of Serbs in the Republika Srpska consider Karadzic and Mladic to be war criminals (15 percent and 13 percent), despite the multiple UN verdicts on genocide. The result was not surprising, as Serb officials consider these war criminals to be heroes and promote them in the media and at schools and events – all before the eyes of the international community. What Europe believed could never be repeated after the Holocaust happened only 50 years later in Bosnia, in the heart of the continent. Today, it seems unimaginable that another Srebrenica or Sarajevo could take place, but no one is doing anything to prevent it. Last time the international community played down the threat of a Slobodan Milosevic, Radovan Karadzic or Ratko Mladic, we witnessed one of the biggest crises since World War Two. The rhetoric is the same, the target is the same, the international community is the same. The actors are different, but history might well repeat itself. – Ismail Cidic is president of the Student Parliament of the International University of Sarajevo. He is the coordinator of the Bosnian Youth Forum that advocates for Bosnian causes and interests in the international media.